From TMI mirror selfies to basically any Kim Kardashian selfie, cell phone cameras and social media have officially blurred the rules of what's appropriate to share... and what's not. But for one woman in New York, it might have been a case of simply taking a selfie at the wrong time. 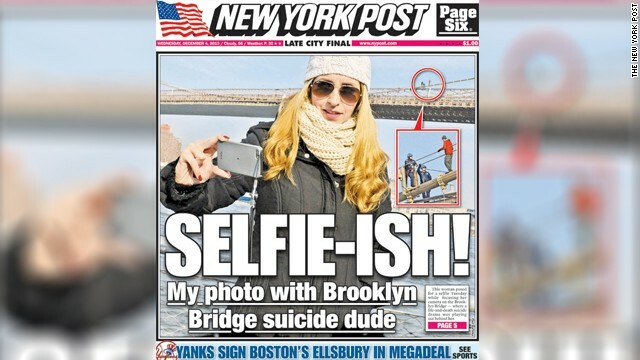 The New York Post published a picture of the young, blonde woman on the cover of its Monday edition, taking a selfie with a man attempting to commit suicide in the background. Perhaps, however, she didn't notice the suicidal man and was only taking a picture of the Brooklyn Bridge in the background. What do you think? Bloomberg LP, known for its business-savvy reporting, has tripled its revenues in the 12 years since Michael Bloomberg traded his plushy corporate corner office for the city of New York's mayoral podium, according to Fortune. But while "Bloomberg is on track for record revenues of $8.3 billion in 2013 and profits of about $2.7 billion," the company is battling PR nightmares, including its most recent scandal of censoring its own journalists in China. Check out CNN Money's preview of the story after the jump. The publication known for inside-the-beltway news is breaking ground in a new city outside of the nation's capital. Politico's parent company recently purchased Capital New York, a small New York-based website, and Politico founder and CEO Jim VandeHei is gearing up for the company's expansion. "When you look at City Hall, when you look at Albany, when you look at media, even when you look at finance, I think there are huge pockets of this city that are under-covered or that could be covered exponentially better," VandeHei told Bloomberg News. 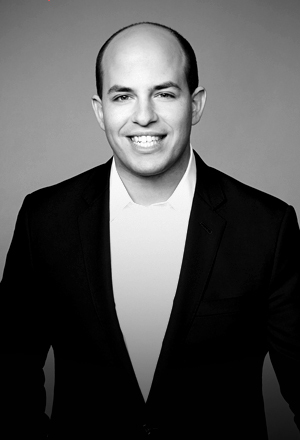 For more on Politico's new venture, tune in later this month for Brian Stelter's interview with VandeHei, and watch for Stelter's debut show this Sunday at 11am ET. Chinese censorship – American Style? James Fallows, Demetri Sevastopulo & guest host Eric Deggans discuss Bloomberg's alleged censorship of reporters and articles in China. In April 2012, the New York Times published a five-part series of articles written by New York Times published reporter John Branch, illustrating the reality of the cultural pressures surrounding a girls' basketball team, Carroll Academy, a juvenile court-run school in Huntingdon, Tennessee. 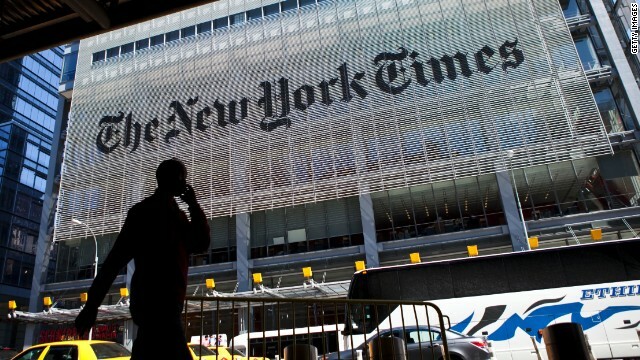 The sports editor of the New York Times received an overwhelming amount of public support for them team following the series being published. In response to the reaction, Branch revisited the team, the “Lady Jaguars,” to write two more articles, highlighting the community struggling with “high unemployment, teen pregnancy and rampant methamphetamine and prescription drug abuse.” The New York Times decided to turn Branch’s stories into a 17-minute documentary, the first “Times documentary”-branded video that the traditionally print-based publication has ever produced. The Huffington Post discusses the role of documentaries in telling a traditional print-story and how it changes the consumption of the story for its’ viewers. Buzzfeed discovers the "Smartest Ever Ad Campaign to use National Flags"
Grande Reportagem, a Portuguese news magazine, hired a Lisbon-based ad agency called DraftFCB to create a simple yet effective print ad campaign that is geared to represent humanitarian struggles worldwide through the imagery of various country’s flags. For example, an image of the United States represents American’s knowledge (or lack there of) of the Iraq War. The blue space represents the number of Americans who do not know what the Iraq War is, in comparison the red space which represents those in favor of the War, and the white space, those opposed. While the statistical representations are not completely accurate, due to the rough-to-scale proportions of the flags images, they do a great job of informing the viewer of the general disparities in human conditions worldwide. New York Attorney General Eric Schneiderman's office is investigating how much access Bloomberg LP news reporters may have had to the company’s customers. “The probe follows inquiries made in May by the U.S. Federal Reserve and the U.S. Treasury into Bloomberg customer data access,” The Wall Street Journal reports. The article also discusses the issue of reporters' knowledge about client activities in a wider context describing how the issue first came about in 2012 when “officials complained to Bloomberg about reporters' access to bankers and traders' whereabouts and log in data, which the firm felt was a violation of its employees' privacy." Jane Hall, Joe Concha & Howard Kurtz talk about Bloomberg News’ admission that reporters monitored executives’ use of terminals. Howard Kurtz on NBC's cancellation of Rock Center, Bloomberg reporters' data snooping & the Fox News mole's day in court.